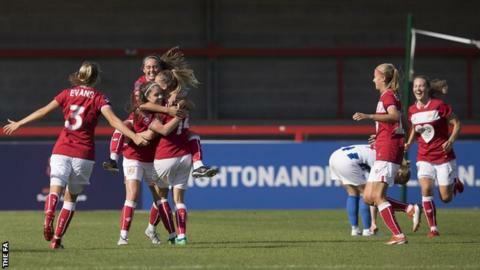 Lucy Graham's second-half strike sealed a season-opening Women's Super League win for Bristol City Women at Brighton. Kayleigh Green had the best chance for Hope Powell's Albion side in the first half when her close-range shot was saved by Sophie Baggaley. Ella Rutherford was denied at the other end by Laura Hartley before firing wide with another attempt. Baggaley turned away an attempt by Beth Roe before Graham found the net for City with a dipping long-range strike. Match ends, Brighton and Hove Albion Women 0, Bristol City Women FC 1. Second Half ends, Brighton and Hove Albion Women 0, Bristol City Women FC 1. Attempt saved. Lucy Graham (Bristol City Women FC) right footed shot from more than 40 yards on the right wing is saved in the top left corner. Offside, Bristol City Women FC. Carla Humphrey tries a through ball, but Heather Payne is caught offside. Corner, Brighton and Hove Albion Women. Conceded by Danique Kerkdijk. Corner, Brighton and Hove Albion Women. Conceded by Julie Biesmans. Delay in match Lucy Graham (Bristol City Women FC) because of an injury. Corner, Bristol City Women FC. Conceded by Laura Rafferty. Substitution, Brighton and Hove Albion Women. Sophie Perry replaces Kate Natkiel. Attempt blocked. Carla Humphrey (Bristol City Women FC) right footed shot from the right side of the box is blocked. Assisted by Heather Payne. Felicity Gibbons (Brighton and Hove Albion Women) wins a free kick in the defensive half. Foul by Heather Payne (Bristol City Women FC). Substitution, Bristol City Women FC. Katie Rood replaces Ella Rutherford. Corner, Brighton and Hove Albion Women. Conceded by Heather Payne. Aileen Whelan (Brighton and Hove Albion Women) wins a free kick on the left wing. Goal! Brighton and Hove Albion Women 0, Bristol City Women FC 1. Lucy Graham (Bristol City Women FC) right footed shot from outside the box to the high centre of the goal. Offside, Brighton and Hove Albion Women. Ellie Brazil tries a through ball, but Ini-Abasi Umotong is caught offside. Foul by Bethan Roe (Brighton and Hove Albion Women). Lucy Graham (Bristol City Women FC) wins a free kick in the defensive half. Substitution, Bristol City Women FC. Gemma Evans replaces Ali Johnson. Substitution, Brighton and Hove Albion Women. Ini-Abasi Umotong replaces Kayleigh Green because of an injury. Delay in match Kayleigh Green (Brighton and Hove Albion Women) because of an injury. Attempt missed. Jodie Brett (Brighton and Hove Albion Women) header from the centre of the box misses to the left. Assisted by Kayleigh Green. Substitution, Bristol City Women FC. Heather Payne replaces Jessica Wooley. Attempt missed. Laura Rafferty (Brighton and Hove Albion Women) right footed shot from the centre of the box is too high following a corner. Corner, Brighton and Hove Albion Women. Conceded by Sophie Baggaley. Attempt saved. Bethan Roe (Brighton and Hove Albion Women) left footed shot from the right side of the box is saved in the bottom left corner. Assisted by Jodie Brett. Aileen Whelan (Brighton and Hove Albion Women) wins a free kick in the attacking half. Foul by Ellie Brazil (Brighton and Hove Albion Women). Jessica Wooley (Bristol City Women FC) wins a free kick in the defensive half. Attempt missed. Danique Kerkdijk (Bristol City Women FC) right footed shot from the centre of the box is too high. Assisted by Ella Rutherford with a cross following a set piece situation. Foul by Jodie Brett (Brighton and Hove Albion Women). Carla Humphrey (Bristol City Women FC) wins a free kick on the left wing.